Best Pizza in North Dakota: Our 10 Favorites! Whether it’s for a dinner with your family, at 2 a.m. with your friends after a night out, or just cold for breakfast, pizza is pretty much always good. But certain restaurants do it better than others, and in North Dakota we’ve got a variety of styles to please every pizza fan. From gourmet pies with seemingly endless topping options, to the signature Neapolitan-style, these 10 pizza restaurants in North Dakota know how to satisfy a craving. Located in both Grand Forks and Fargo, Rhombus Guys has been a crowd favorite since first opening its doors. With 34 gourmet pizza options plus a smores dessert pizza, everyone in your party will leave spoiled for other pizza joints forever. On your first visit, be sure to try the award-winning T-Rex (marinara, pepperoni, sausage, Canadian bacon, beef, bacon, bacon and mozzarella) or Rockefeller (roasted garlic white sauce, bacon, shrimp, spinach, onion, tomato, cream cheese and mozzarella) pizzas. Nobody does brick-oven pizza quite like The Starving Rooster. Known for its loaded toppings, the Rooster is home to such favorites as The Hercules (pepperoni, Italian sausage, Canadian bacon, prosciutto & TSR four-cheese blend with red sauce) or The Ground Hog (hand breaded rotisserie chicken, rotisserie ham, Swiss & shredded mozzarella with white sauce). A full beer and cocktail menu is also available. Who says elegance and pizza can’t mix? Famous for its artisanal woodfired pizzas, Blackbird is also known for its handmade dough, created using North Dakota wheat. With a strong commitment to the community and a fierce attention to detail, Blackbird Woodfire produces a pizza unlike any in the industry. Try the sausage apple pizza, made with Béchamel cream sauce, house-made sausage, Granny Smith apples, fresh sage, parmesan cheese, and micro greens. Using a 2.5-ton wood-fire oven that was hand built in Italy, Fireflour has quickly made a name for itself in the Bismarck area. By using high-end ingredients and never rushing the final products, Fireflour can create a final product that is pizza heaven. If you are looking for traditional Neapolitan-style pizza, look no further. Think wood-fire oven meets down-home charm and you have Jonny B’s. If you are looking for a welcoming atmosphere that is as fun as it is humble, look no further. In addition to delicious pizza, including the pale ale bacon burger and Fiery Hawaiian, Jonny B’s also serves a full appetizer and drink menu, including an out-of-this-world lavash. A consistent favorite for over 50 years, Duane’s Pizza is a must-stop for anyone craving a deliciously greasy pie. Duane’s makes its dough daily and uses a special house-made sauce that will have you begging for the recipe. For those in your party interested in something else, Duane’s fried chicken is the stuff of legends. Originally located in Bismarck, Bruno’s has graciously shared its pizza goodness with the northwestern side of the state. In addition to its award-winning pizza, Bruno’s has a diverse menu that includes everything from salads to pasta to calzones. The belle of the ball is the pizza, of course. Try the Marauder pizza (pizza sauce, pepperoni, taco meat, Canadian bacon, drizzled with special sauce) or the Denver Scrambler (cheese sauce, cheddar, cheese mix, Canadian bacon, bacon, green peppers, onions and hard boiled eggs) for a real adventure. Specializing in New York style pizza, Nardello’s is also home to mouth-watering Italian hoagies and Philly cheesesteaks. The restaurant prides itself on its authentic flavors and its ability to bring the east coast to North Dakota. You will not find a ton of toppings on a Nardello’s pizza, but that doesn’t mean it isn’t loaded with flavor. In addition, the restaurant recently added cannolis to the menu, which will make a visit to Nardello’s something you will not quickly forget. A Grand Forks landmark since opening in 1965, Italian Moon has been serving up delectable pizza and Mexican food for decades. With daily specials and a full menu that includes everything from pizza and calzones to burgers and fried chicken, a visit to Italian Moon will satisfy even the pickiest of eaters. If you have never been to a Spicy Pie, fix that situation quickly. 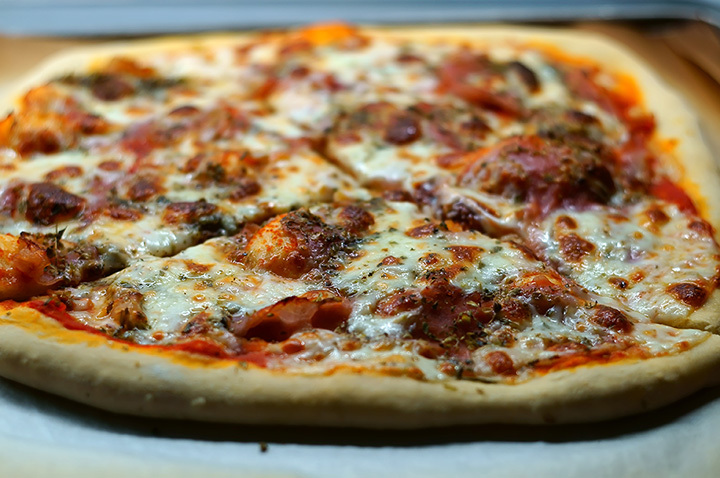 Home to award-winning brick-fired pizza made with fresh, hand-tossed dough, Spicy Pie also offers tortilla chips fried fresh each morning and grinder buns made from scratch. The star of the show is the pizza, however. With secret sauce, Saputo cheese, and specialty Alta Cucina tomatoes, you will never wonder where to order your pizza from again.